I made my way to Scott Creek Conservation Park to my favourite activation spot at Gate 8. It was a warm afternoon with the peak temperature being 32 degrees but by the time I arrived at the Park, just before 1700 hours local it was in the high twenties, cloudy, humid and threatening to rain. A few spots occurred while I was operating and when packing up. This is my fourth activation at this Park but when the weather cools I will become more adventurous and travel further to some of the many other Parks in the Adelaide Hills. Oh, so many parks and so little time! I enjoyed a total of 29 contacts. On 7.100 I used the Yaesu 897 set for 10 watts with a linked dipole and my 4800 MAH LiFePO4 battery. On 20 metres I set the power to 20 watts for the contacts to Spain and 40 watts for the contacts to the UK. It was a great time and thanks to all who gave me a call. I always appreciate the chasers. I used my home made linked dipole. It performed well after a recent service. See my blog dated 1st February to read about the antenna failure on the last activation. Soldered joints, even though not load bearing seem to create the weak spots. All the links, made from 30 amp Anderson Power Poles, are crimped. I am unable to avoid soldered joints at the dipole centre. These are well covered by clear silicon which seems to help. Portable antennas get quite a work out and I am surely impressed with the wire I purchased from Mark at Tet-Emtron. On Friday afternoon at about 4.00pm local time I travelled to Scott Creek Conservation Park in the Mount Lofty Ranges to join with other park activators in a late afternoon/early evening activation. Scott Creek Conservation Park is ‘our’ Park. We are members of the Friends Group for this Park. I also do quite a bit of walking in the park to try and enhance my general level of fitness, or more likely keep what I have already! It is about four kilometres from our place to the Park. It is not the closest park to us: that park is Mark Oliphant Conservation Park which I can see from our family room right now. But Scott Creek Conservation Park, is in my opinion, the more interesting location. I set up at my usual operating point near Gate 8. I managed to find a little shade and established my station there. I was pleased with the set up and took the extra precaution of guying my squid pole at 45 degrees to the linked dipole as there were a few gusts on wind, but nothing too severe. I have activated this park two times previously. I also packed only lithium chemistry batteries. I decided to leave the ‘slabs’ at home. I switched on my radio and tuned across the middle portion of the 40 metre band. 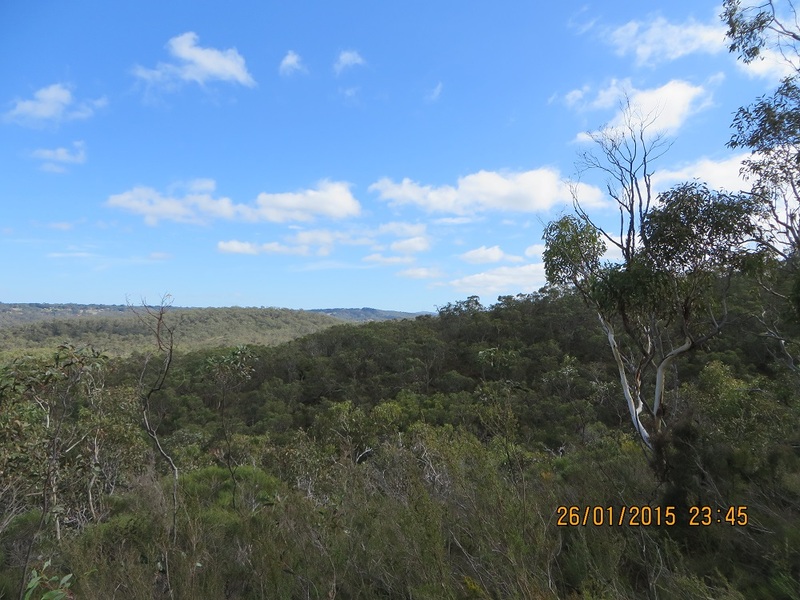 On 7.100 I heard VK5ZAR/P5, Arno, at 06:25z, in Black Hill Conservation Park working another station. Arno’s signal was quite strong, 5 and 7, but I did notice that the signal was fading. I called him a few times without success and then wondered about whether everything was working at me end. It was the contact with VK5ZAR/P5, or rather the variation is signal strengths between us, which persuaded me to close down. I decided I would quit the 40 metre band and change antennas and go to 30 metres as VK5LY, Larry had posted that he would try this band. I posted my intention to QSY on ParksnPeaks. I have a home brew half-wave end fed antenna for this band. 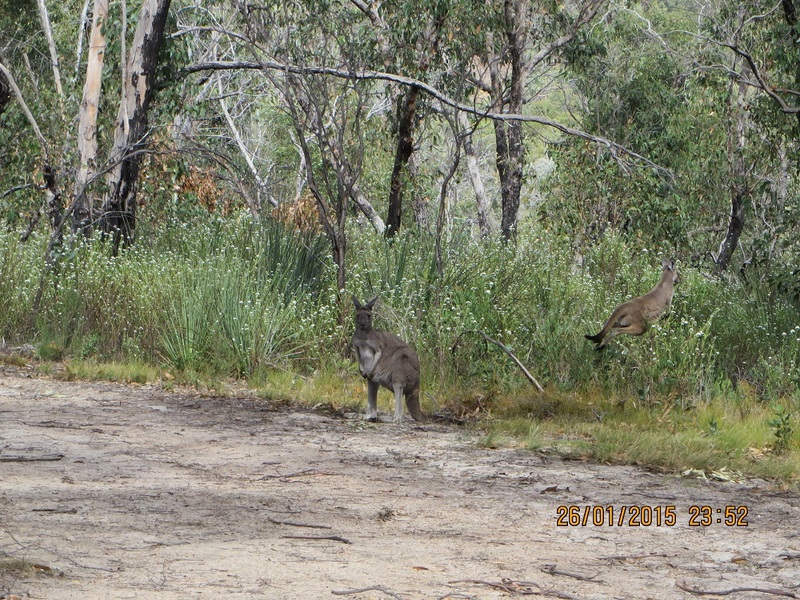 I had checked it out previously at Spring Gully Conservation Park near Clare and was pleased with its performance. Tuning across the band I noticed a fairly strong CW signal (too fast for me) and a RTTY signal which was very strong. I called on 10.130 MHz a few times without success. I have subsequently checked my antenna at home for continuity (it is fine although it has been used over 120 times in the field) and when the weather improves will do some careful checks outside to try and establish the reason for the high VSWR. It was a beautiful afternoon and I enjoyed my time in the park despite the equipment failure. This photo shows Mount Lofty in the distance. Expand the photo and two peaks emerge. Mount Lofty is the second and smaller of the two in the centre of the picture. The last image shows the walking track I use. The photo does not do justice to the steepness! The track here is between three and five kilometres from the start: see profile image above! The loop starts at the at the car park at gate three: in the picture just under the name of the park. Take the Bandicoot Track, then Currawong Ridge Track then Cup Gum Track to Gate 8. At this point take the Mount Bold Track (in the Park near the boundary), then Stringbark Track to Neville Road, turn North (right) and take the Currawong Ridge Track to Bandicoot Track and down the hill to the car-park. 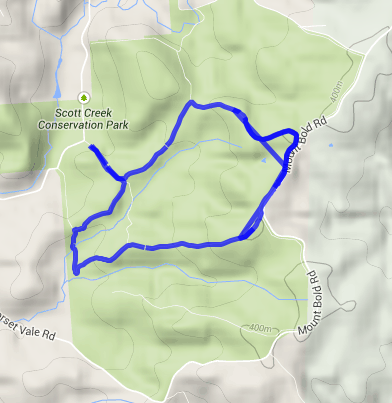 I take the clockwise walk of just six kilometres and it takes me about one hour 20 minutes to complete the loop. 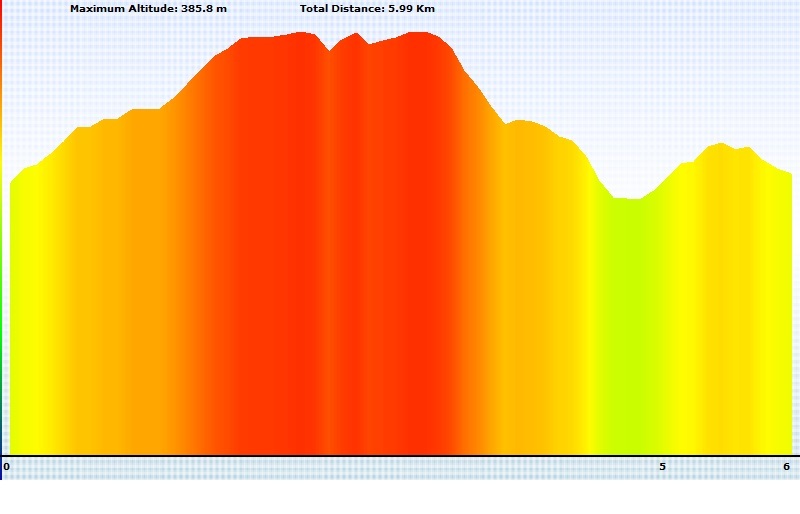 There are some very steep hills! Gate 8, my activation spot is on Mount Bold Road in the right hand corner of the image. I have completed this walk quite a few times now and will provide more information in due course. The track is taken from a Garmin Forerunner 910 XT. This GPS is designed for monitoring fitness programs and is worn on the wrist. Coordinates are only available after the data is transferred from the unit to Garmin Connect. 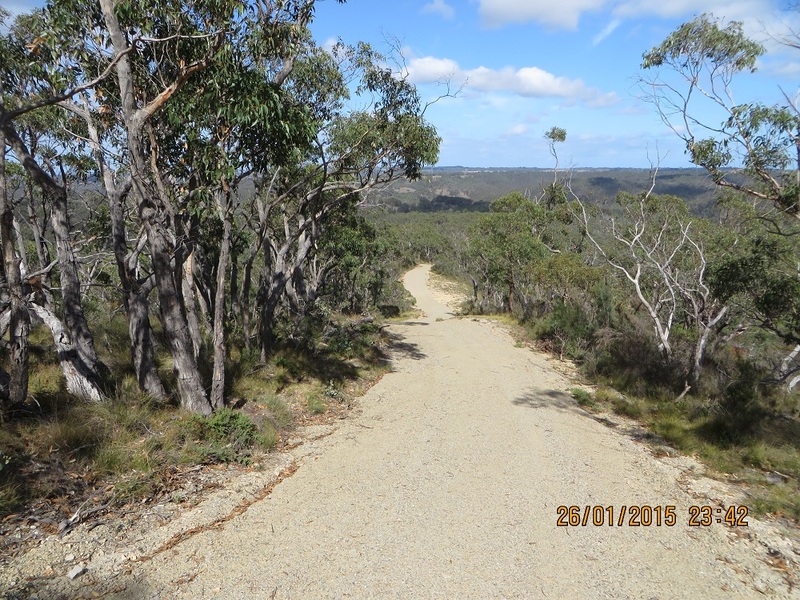 I used the same unit for my walk in Scheyville National Park, VKFF-444, on 21st December 2014 and also at Mt Bryan, VK5/SE-001 on 29th September 2014. I have also walked the track with my old Kenwood TH-D7 set at five watts with an extended antenna. 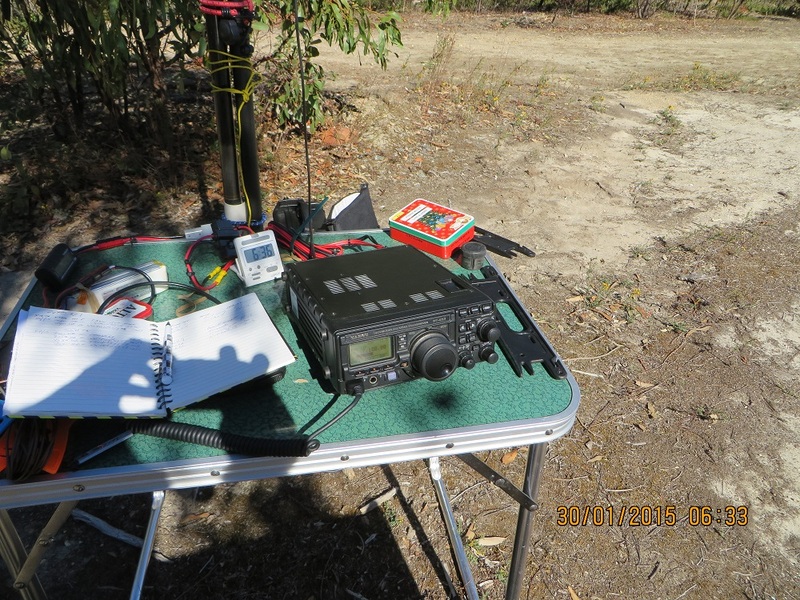 The highest point on the track is approaching Mount Bold Road, over 400 metres, and my signal was received at the VK5RSC-1, the South Coast Amateur Radio Club’s digipeater on 145.175. I could only access the digipeater at one spot. The upshot of this is that to have a APRS station at Gate 8 is feasible with a more powerful radio and a gain antenna on a mast. Something for the future with a more extended activation!